Amazon.com Product Description With the Vista Cx, Garmin has updated a much-loved device withexpandable memory on microSD card so you can load optional map data for your hiking, hunting and other outdoor excursions. Add to that a bright, full-color TFT display, automatic routing, and long, 20-hour battery life, and you've got a great companion for your next outdoor or boating adventure. Plus, the Vista CX adds a barometric altimeter and an electronic compass. The main menu feature icons. View larger. Crisp, color display for easy map viewing. View larger. Altimeter display provides elevation information. View larger. The Vista Cx features a bright color display, electronic compass and a barometric altimeter and much more. 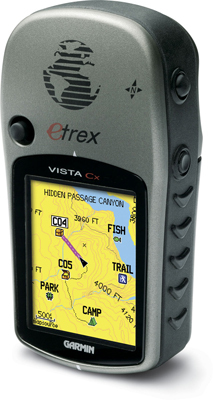 You can use the Vista Cx's memory card slot with preprogrammed microSD cards from Garmin (sold separately) that provide topographic maps, city streets, and nautical charts. In fact, the unit is compatible with most Garmin MapSource products including BlueChart, City Navigator, U.S. Topo 24K, and U.S. Topo and Recreational Lakes with Fishing Hot Spots. The unit comes preloaded with an Americas autoroute basemap that provides automatic routing capabilities including highways, exits and tide data. You can even get turn-by-turn directions when you're driving and an integrated trip computer provides odometer, stopped time, moving average, overall average, total time, max speed and more. The Vista Cx's barometric altimeter system features automatic pressure trend recording while providing current elevation, ascent/descent rate, minimum/maximum elevation, total ascent and descent, and average and maximum ascent and descent rate. Meanwhile, the unit's electronic compass allows you to get accurate headings while standing still. Like on all eTrex units, the primary controls are located on the side of the unit, so you can operate it with one hand. An innovative rocker switch on its face makes inputting data easy, and with it you can scroll through menus or pan the map page. Fast USB connectivity makes loading charts and maps quick and easy, while navigation instructions can be shared with repeaters, plotters, and autopilots using NMEA protocols through the dedicated serial port. Additionally, the case is water-resistant to IEC 60529 IPX7 standards (can be submerged in one meter of water for 30 minutes). Another key feature of the Vista Cx is the 10,000 point automatic track log; 20 saved tracks (500 points each) let you retrace your path in both directions. Meanwhile, there's a large numbers option for easy viewing, as well as a dual position display mode. Lastly, the unit includes built-in celestial tables for best time to fish and hunt, plus sun and moon calculations.